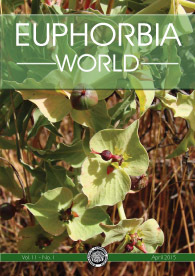 About our Journal "Euphorbia World"
The society produces a full colour A4 size journal three times a year, with fully illustrated articles on all aspects of this fascinating plant family, to appeal to beginners as well as specialists. 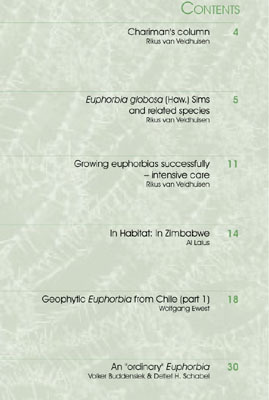 The journal is refereed by well known botanists including Susan Carter Holmes, who is also our President. 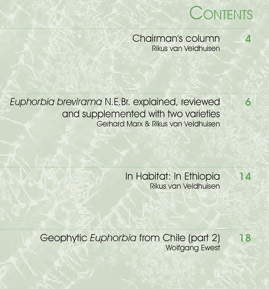 The language is English. 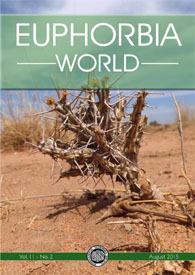 You can read a German review on Euphorbia World which was published in "Berichte der Bayerischen Botanischen Gesellschaft", Band 77, 2007.